He had good reasons for not bowhunting Merriam turkeys. Now he has even better reasons for hunting them. my very first day of turkey hunting. My heart rate had been up since they wandered into view a few minutes earlier, and my mouth was dry from fast, shallow breaths. The tension was growing. The tom wouldn't court that decoy forever, and two sets of very sharp eyes had to be diverted in order for me to draw. As the adrenaline sparked through my veins, I smiled behind my facemask and thought, Why did I wait this long to start hunting turkeys? The answer, as odd as it might sound, began as a biological issue. I have a rare allergic condition that prevents me from eating any kind of bird, wild or domestic. As a hunter who believes in consuming any game harvested, I really didn't pay much attention to bird hunting as I grew up. I would occasionally bag a grouse or two for the guys in camp as we hiked around the mountains elk hunting, but that was about the extent of it. Now I have a family that loves game meat, and my young son in particular wanted to try some wild turkey. I'd read about the challenges of turkey hunting and the comparisons to elk hunting with the calling, camouflage, and sharp senses of the birds. It sounded fun, but, still, should I hunt a species I myself could not consume? My answer was that my family deserved to experience what many of my friends said was a fantastic meal. So I decided to hunt turkeys. That brought up a second problem: I didn't know the first thing about turkey hunting. I'd seen plenty of television shows, but most of them involved hunting from a blind. I didn't even know where to hunt turkeys, let alone where to post a blind, and I new little about their behavior -- all significant obstacles. So I decided to tackle my shortfalls systematically. I began by researching guides and outfitters in my home state of New Mexico. I believe that learning from an experienced guide is worth the expense, and it can really improve your abilities. I started by inquiring through the New Mexico Council of Guides and Outfitters and narrowed my selection to a handful of candidates based on reputation, references, and track record with bowhunters. Then I called a few, telling them what I wanted from a hunt. My last call was to Kyle Bell of Folsom Outfitters in northern New Mexico. I liked Kyle's friendly demeanor, and we hit it off well. Kyle explained that he hunted in the mountains at 7,500 feet elevation. That sounded interesting to me, a bit different from the norm. When I asked about his approach, he said, "I won't drop you off somewhere or set you in a blind. We will hunt those birds." That sealed the deal, and I booked a three-day hunt for early May. With the date set, I read everything I could find about Merriam turkeys and turkey hunting. In listening to tapes and watching DVDs, I was amazed at the diversity of vocalizations these birds produce. I was even more amazed at their sensitivity to movement and danger, making me wonder if it was even possible to draw a bow undetected without the aid of a blind. Half sitting, half kneeling in this natural blind, I moved only my eyes as a hen turkey fed just 10 feet away. To round out my preparations, I practiced shooting at 3-D turkey targets from every conceivable position: kneeling, sitting, crouching, leaning around obstacles. I also reviewed a shooting tip Randy Ulmer had presented on Bowhunter TV in which he described the best way to practice a slow, controlled draw. I put in many reps, incorporating Randy's technique into my odd shooting positions. Little did I know how important all this would be. When May finally rolled around, I felt prepared but perhaps a little concerned about applying my "book smarts" in the field. However, as soon as Kyle and I shook hands at his ranch, I knew I was in good hands. A Texan who had relocated to New Mexico 20 years ago, Kyle cut a rugged western image. But his kindness and confidence immediately put me at ease. Kyle has guided for many years, and he and his wife, LeVonne, founded Folsom Outfitters in 2001. I was their last turkey hunter of the 2009 season. The previous four hunters had killed seven birds (New Mexico has a two-turkey spring bag limit). After a delicious dinner and a strategy session, I went to bed eager to hit the woods. At 5 a.m., we drove a short distance to a mesa just at first light. As we stepped from Kyle's truck, the temperature was 40 degrees, and thick fog pushed along by a stiff breeze greeted us -- not ideal turkey hunting weather. The weatherman had said the weather would clear later that day, and I hoped he was right. Current conditions hardly seemed promising. We hiked along the rimrocks of the mesa and dropped into several small drainages to look for roosting birds. Kyle described why the turkeys stayed in this area and patiently answered all my questions about their habits. Spotting only one lone hen on top, we crossed the mesa and dropped down a steep elk trail into a thick stand of dark timber. As we slowly worked deeper into the big ponderosa pines and bristly spruce trees, we came upon a small grassy opening where Kyle pointed out considerable sign of turkeys feeding. "This is a good spot to set up," Kyle whispered. "Find a place to hide, and I'll go off about 30 yards and do some calling." Locating a small spruce in front of an upturned stump, I wiggled between the two and cut a shooting lane, leaving just enough branches to break up my form. At the same time, Kyle staked out a hen decoy and slinked off into the brush to my left. I ranged the decoy at 15 yards. Soon Kyle began scratching lightly on his slate call, and he had called for scarcely 30 seconds when I heard soft clucking to my right. Moving only my eyes, I saw a hen walking into view, feeding toward my position. As she hopped several logs and scratched in the dirt, she kept coming until she was no more than 10 feet away. My heart hammered against my ribs. How could a bird get me so excited? I wondered. e hen was feeding in plain view. Be patient! I kept telling myself, even though my muscles protested loudly as I half sat and half knelt, trying to blend in with the little spruce. As more minutes passed, the hen made a few aggressive passes at the decoy while the tom watched. Apparently deciding it was no threat, the hen began to feed away, out the far side of the clearing. I feared the tom would soon follow. Fortunately, he was still a bit mesmerized by the decoy, and as he turned slightly to keep an eye on his live mate, his head disappeared behind his fan. Applying Randy Ulmer's lessons, I reached full draw just as the tom returned his attention to the decoy -- for the last time. With my sight pin on his vitals, I released automatically. At the impact of the arrow, the tom flipped in midair, landed in a heap, and flapped his wings against the ground for the last time. Scrambling from my hiding place, I hustled down to the bird as Kyle emerged from the brush, a witness to the whole scenario. We took a few minutes to appreciate our good fortune. I was still buzzing with excitement when we got back to the truck. Later that evening, as my young son devoured breaded turkey cutlets (Kyle's own recipe) as fast as I could put them on his plate, he declared he wanted to hunt turkeys as soon as he was old enough. I promised him he could, glad I'd decided to hunt this amazing quarry, and still in awe of the whole experience. I was especially pleased it had sparked more interest in my son to start hunting. I thought back to my parting words with Kyle when he congratulated me by saying, "Not bad for a first turkey hunt." He was right, and I was sure it was the first of many, many more. A resident of Albuquerque, New Mexico, the author is our "Survival" columnist. 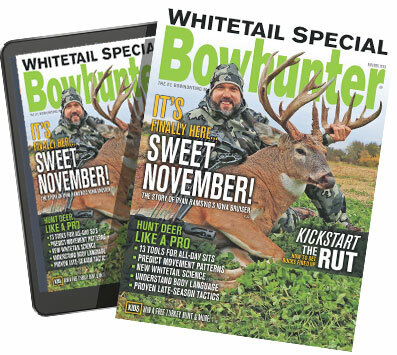 Author's Notes: On this hunt, I shot a Browning Mirage bow at 65 lbs. draw weight, Gold Tip shafts, and G5 Montec broadheads. I wore Mossy Oak camouflage and Cabela's Ultimate Bowhunter's Vest, which I really liked. The pockets are set up so you can easily locate and use a rangefinder, camera, call, and other gear. In addition to turkeys, Folsom Outfitters offers hunts for elk, mule deer, antelope, black bears, and bison. The accommodations are topnotch. Kyle personally guides most of the hunts, and he understands bowhunting. Contact Kyle Bell at (575) 278-2444, or see details at www.folsomoutfitters.com.